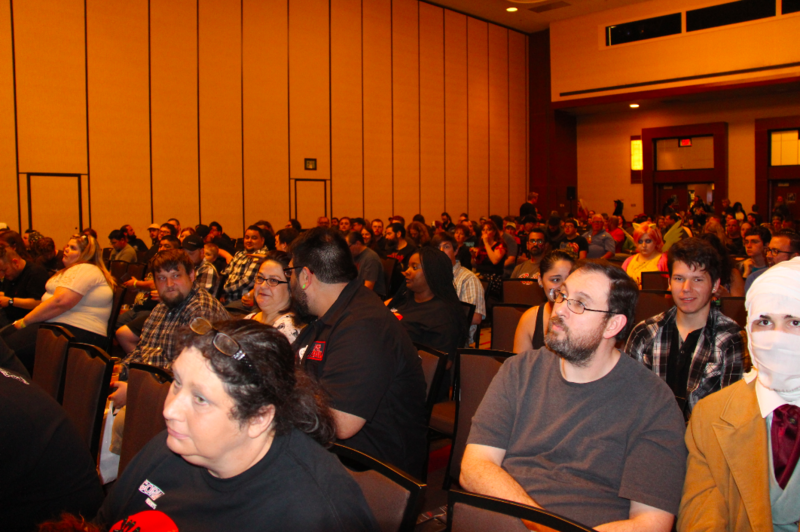 One of the highlights from the Texas Frightmare Weekend horror convention was the amazing selection of film screenings. Although it was nearly impossible to get to all of them, I attended as many as I could. One of the most obviously anticipated screenings, judging by the packed audience and the palpable enthusiasm of the crowd, was the weekend’s ‘Secret Screening’. The fact that the name of the movie couldn’t be revealed before the screening meant we were about to be treated to something exclusive… something few had seen before us. Originally, we were supposed to be only the second audience to ever view the film. Instead, we were watching the Texas premiere. Finally, the lights went down and the opening credits starting to roll. The long awaited secret was finally revealed… for me, almost immediately. As soon as the music started, followed by the unusually long list of writers and directors, I knew what we were about to be treated to. When the film’s title finally graced the screen, the crowd went wild. And one of the year’s most anticipated horror films, HOLIDAYS, began. For me, there was a moment of disappointment. I had just watched HOLIDAYS on VOD the day it came out and had already reviewed it (read review here). Although I enjoyed the film, I was hoping for a completely new viewing experience. Surprisingly, that’s exactly what I got. 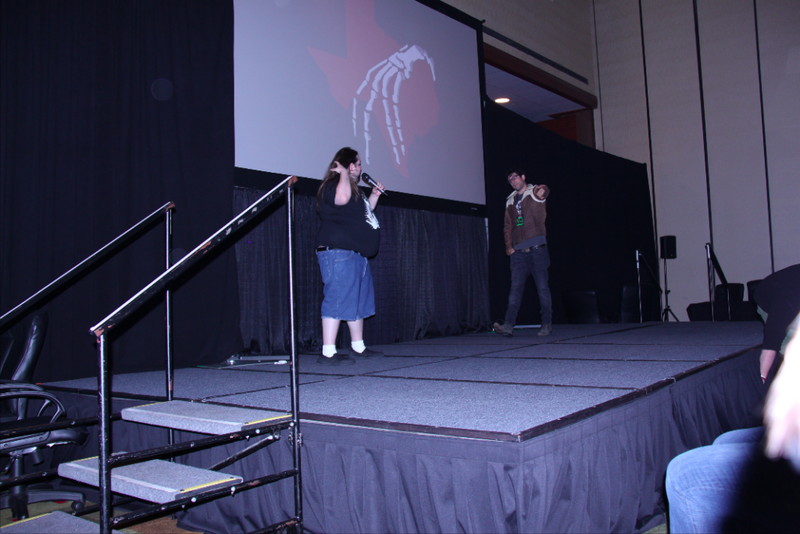 The minute the movie began on that big screen, surrounded by a room full of people who love and appreciate horror as much as I do, I was immediately swept up in the tide of the crowd. I saw the film again for what felt like the first time. Every segment of the horror anthology was better than I remembered. Every joke was funnier, every scare more on point, every reveal more satisfying. There was an infectious kind of joy that reminded me why movies are meant to be a communal experience. 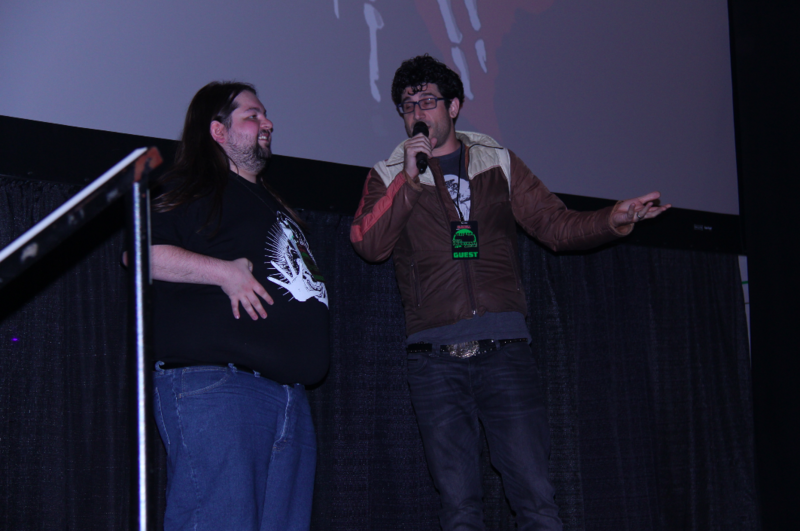 After the movie, the crowd was treated to a Q & A from up-and-coming filmmaker Adam Egypt Mortimer. Adam helped produce the film and also directed the final segment, “New Year’s Eve”. He also wrote and directed the 2015 horror film Some Kind of Hate. He was quirky and funny, charming and completely forthcoming as he talked about his experience working on the film. Adam acknowledges that it’s a great time for anthology films, thanks to the success of franchises like V/H/S and The ABCs of Death. Each producer on HOLIDAYS was asked to bring in a couple of directors to the project. Adam shares his amazement at being able to secure such talented and high profile directors. In a film boasting so many different and distinct filmmakers, each given creative license to do anything under the sun, the movie itself feels strikingly cohesive and unified. While every segment has its own unique style, there is a consistency that is rare in these types of anthology films. And Mortimer explains that this consistency was completely organic and unexpected. Mortimer teases that he’d love to do a sequel if the first film is successful enough. Obviously, as the crowd points out during the Q & A, there were many holidays the film didn’t tackle that fans are chomping at the bit for. The rise of on demand entertainment has certainly been beneficial in many ways. It’s given horror fans access to a much broader range of movies and helped smaller, independent films find an audience that would have previously been impossible. So many amazing films never find a theatrical release, or it’s an extremely limited one. Further, many of the films that receive a wide theatrical release are watered down by the studios or forced to cater to younger audiences with a PG-13 rating. As much as I love and support streaming entertainment, typically watching several movies a week from the comfort of my home on a variety of streaming services, there’s something truly magical about a great theatrical movie watching experience… and it’s something I hope we never lose. With the trend now to release movies on VOD at the same time or even ahead of the theatrical release, it can be tempting for horror fans to wonder what the point is of trekking out to the theater. It’s not cheap, and it’s certainly much less convenient. But there’s an experience you get when watching a movie the way it was intended, on a big screen in a room full of people. It’s an experience that is impossible to duplicate at home. Watching HOLIDAYS for a second time with a rabidly enthusiastic audience really drove that point home from me. My hope is that you’ll watch as many movies as you can at home. Pay for them (please, for the love of horror, don’t pirate them). Show love and appreciation for the smaller films that never see a theater. They will likely be some of the smartest, most thought provoking, most memorable films you’ll see all year. But, when you can, make the effort to support horror in the theater. You’ll get to see movies in an entirely new way, and you’ll be helping to ensure that more deserving horror can be seen by as many people as possible.